1) Product Cross-Numbers : Every technical product (e.g. engine parts, machine part, etc.) has a product number. Not only that, but it has cross numbers. So a Wix filter will have Baldwin, Napa, Donaldson, Fram, et. al. crosses. They each have their own product number that crosses to each other. Question: How would you recommend displaying this information to a customer in a structured, consistent way? The former Attribute feature allowed this easily. That said, I get that storing 2,000 unique values under an Attribute called: "Other Product Numbers" would pile up the values, but your solution might not be the best solution. I would suggest that you allow, as before, the ability to make an Attribute "Selectable" or "Text". If, text, you should turn off the Attribute value features and simply keep the Attribute as a free text string. 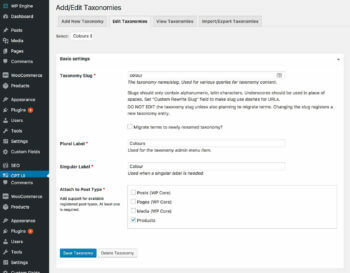 What this solution would enable is 1) Enforcement of a consistent Attribute title on the front-end such as: "Other Product Numbers;" 2) It also enforces the person creating products on the back-end a reminder that that value, which would appear in a drop-down of Attributes, would be required (not technically, but via workflow -- namely, it's a configured Attribute name in the drop-down. Without enforcement of the Attribute value, there is no way to ensure a consistent end-user experience on the front-end. Now we will have various product creators creating ad hoc (what you call "custom") Attribute names such as "Other Product Numbers," "Crosses," "Other Numbers," not to mention mispellings. When you have 1,000's of products, you can see that there is no way to enforce this on the backend with multiple product creators. I would argue that you threw the baby out with the bath water. You solved one problem (proliferation of Attribute values), but killed a very valuable feature that allowed free text strings against an enforce Attribute name (e.g. "Other Product Numbers"). I would also argue that you might have lost sight of the original use-cases that built the Attribute feature in the first place and why they allowed text strings versus only a tag structure. Most of my clients are parts suppliers and cross-reference numbers are the life-blood of optimal SEO and marketing. Now we have no way to do this, but we did. So the ability to enforce consistent Attribute names is no longer available. To accuse me of product misuse, is simply not productive. There is no other way to use WooCommerce for the parts industry. Tags and Categories don't work. Free text in the product description and Free text via the Custom Attribute is too loosely-goosey to enforce a consistent backend workflow and consistent front-end experience. Take this as an example from a filter on Amazon. I used to be able to mimic this 100%. Now it's impossible in a scalable way. Practically every single product in Amazon requires this feature! Please tell me how I am supposed to mimic this? 2) Maintaining consistent private notes: The same old feature was able to accomplish this, just a different use case. Attribute enforcement of a private value (e.g. Source). 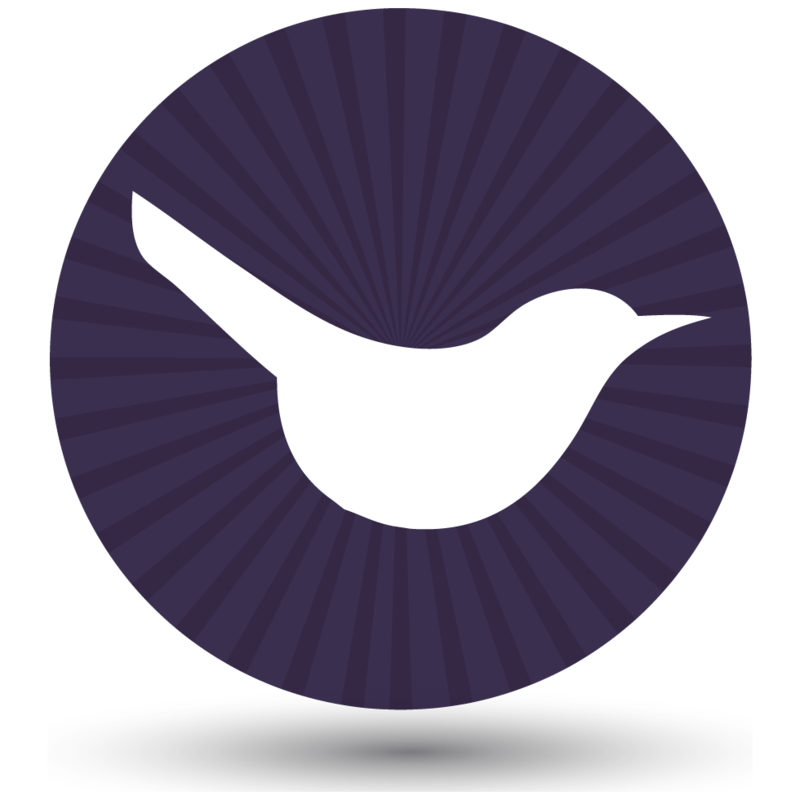 This is the private source for a product I sell that has replenishment details. Yes, this might not be a color, size, etc. But a critical piece of our business. 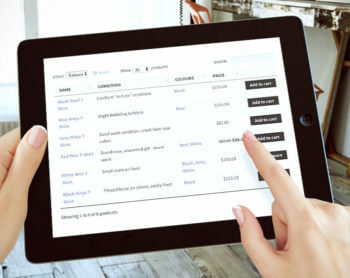 People that maintain complex catalogs of products with multiple suppliers, need to keep track of where they buy their products and other details. Again, this was supported via the no-publish feature, which you still have, but now their is no way to enforce the Attribute name (just like #1). >> Keep the ability as you have today of publishing or not publishing the value. My parts customers are pissed to no end. This will be hours and hours of work to clean up 10,000 products across 10 customers and even then, there is still no way to enforce Attribute names on the front-end. We may ditch WooCommerce and migrate off the platform as this is unworkable for us and not sure if any plugin can fix this without complicating the back-end and front-end code. I would venture to guess, that EVERY single product listing on Amazon could not be replicated in WooCommerce due to the above. Every product has UPC, NSN, ASIN, etc. etc. product codes. There is NO way to replicate this functionality in WooCommerce now and that is a massive issue. I don't think users have actually realized what happened and you will receive more and more complaints related to this. It took me a while to figure out what broke. Thank you for listening and your patience. This is such a big issue for us that it may require us to find a new eCommerce plugin to WooCommerce as it seems the engineers/product folks have broken a feature more than fixed it and have completely made it impossible to mimic the most basic of product listings (enforced Attribute names, with free text values). Wow, I think that is the most in-depth comment anyone has ever left on this blog! You're right, it's a shame that you can't use attributes to do all these things. WooCommerce seems to think that an attribute is just for listing data about products, when some sites were using them for much more than this. I have a question before I buy. Is there a conflict between custom fields and your plugin. My customer would like to replace the default drop down options shown in woocommerce for product variations in a table. His products require some custom fields such as custom printing, specific date and upload customer logo. He sells products with over 500 variations on some products. He is interested in making it easy for a customer to quickly select his selections using variations listed in a table or with drop downs in table format. Thank you. 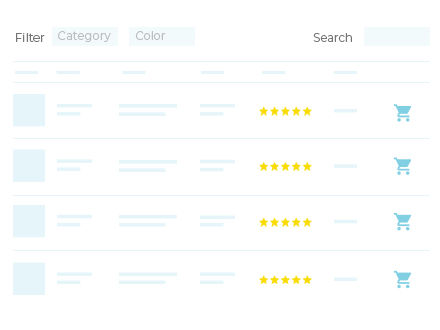 Hi Rick, WooCommerce Product Table fully supports the Advanced Custom Fields plugin and you can display your custom fields as columns in the table. We have also tested with Toolset Types, Custom Post Type UI and Pods and found that they all work nicely with WooCommerce Product Table. 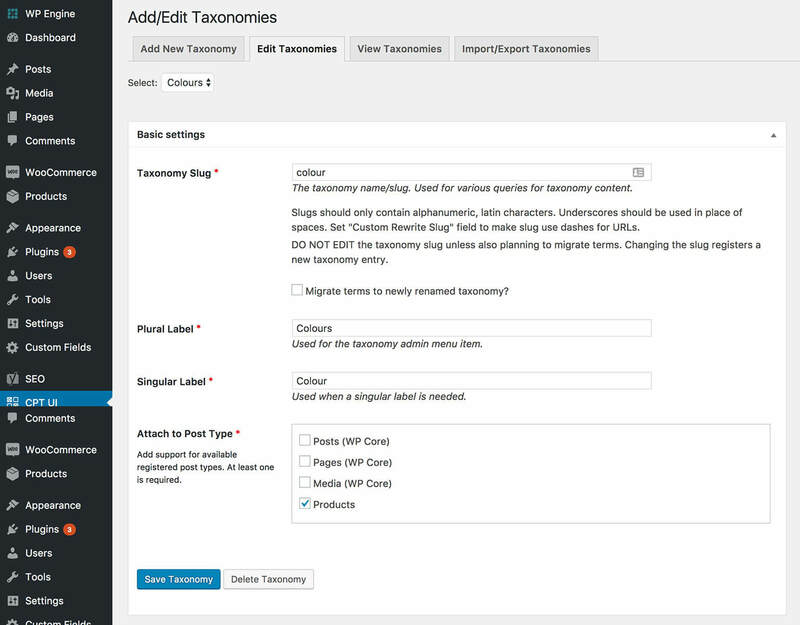 You can add attribute/variation filter dropdowns above the table or to a sidebar widget. You can also add variation dropdowns to the add to cart column of the product table. However, please be aware that 500 variations for a single product is a HUGE amount of data to load all at once, and may cause performance issues. This would also happen if you listed so many variations on the single product page, but it could be worse in a product table because you are listing multiple products on one page. If this is a problem then you can always disable the variation dropdowns so that customers can click through to the single product page to choose their variations. In the next few months we also plan to add a 'Quick View' option that lets people click on a button to view more information and select variations from a lightbox, so this might be a good option for your customer. WooCommerce Product Table has a lazy load option which loads one page of products at a time, so this might help. Please bear in mind that we have a 30-day money back guarantee so you can try the plugin risk-free. Thank you for your speedy reply. The custom field plug in we are using is: Woocommerce Custom Fields by Rightpress. Are you familiar with this one? You are absolutely correct about the difficulty in trying to use a table for multiple products. My customer wants to use the table on a single product page where their customers can dial in the variations they need in ordering products, colors, sizes and other custom attributes. Do you see any other barriers we might encounter with your product? You can use WooCommerce Product Table with any custom fields plugin. You just need to find out the correct name for the custom field so that you can list it as a column in the table. To be honest, using WooCommerce without any extra plugins might potentially cause performance issues on the single product page if a product had 500 variations. If you use WooCommerce Product Table to list the same number of variations then it should take about the same time to load. What matters is the amount of data being loaded with the initial page load, rather than the exact method. As you probably know, variations can be a nightmare to manage if you have lots of them. It's worth checking out the Product Add-Ons plugin which makes is slightly easier to manage large numbers of options, and ha a copy and paste feature which makes it easy to copy add-ons between products. We have fully integrated WooCommerce Product Table with Product Add-Ons and you can use add-ons with simple or variable products.